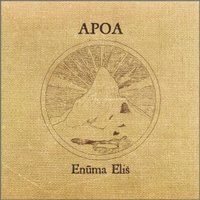 Apoa doesn't seem to be satisfied with being a post-rock band although their music will be a very good addition to every post-rock collection. But Apoa incorporates several other influences in their sound, making them somewhat unique. Here, too, you can find some influences from Cocteau Twins or Slowdive but there's also a lot of dark rock and post-punk in here, sometimes even to the extent of gothic metal (without the singing dresses). This results in a very heavy album with a lot of psychedelic and atmospheric passages. interspersed with clean, dreamy sections. It's quite remarkable that all of this power comes from just one guitar. After all, Apoa is a trio that has put a lot of variation in their sound. Drums and bass function as a solid foundation for these extended sonic journeys, often reminding me of the 'party-post-rock' that bands like Sleepmakeswaves have been creating. It's easy to let yourself float along with the sound on this seven-track album. Yet, it's also very tempting to start some serious headbanging on some occasions. Picking a favourite track is an almost unattainable challenge so I'm not going to do that. Each track can easily stand on its own but they also perfectly fit in with the conceptual flow of this album. The overall feel is pretty dark. Here and there influences from bands like Katatonia, Tool, Oomph or Deftones impose themselves. However, the fact that Apoa succeeds in writing these epic songs without the use of vocals is proof of their talent. These seem to be experienced musicians who have a great technical know-how. They're well able to tell spectacular stories, without words.